Zika Is 'Game Changer' For OB-GYNs In Florida : Shots - Health News For some obstetricians and gynecologists, Zika virus is transforming how they practice medicine. Talks with pregnant patients now include testing for the virus and the risks of long-term effects. Dr. Christine Curry says Zika virus has been a "game changer" in obstetrics and gynecology. Late last fall, Dr. Christine Curry was at a faculty meeting with her colleagues when the conversation turned to new reports linking the Zika virus to a surge in microcephaly in infants in Brazil. "I think it's fair to say that most obstetricians had never heard of this virus a year ago," said Curry, an assistant professor of obstetrics and gynecology at the University of Miami Miller School of Medicine and Jackson Memorial Hospital. Curry also has a background in virology, so she volunteered to look into it for the rest of the staff. "I knew from the get-go that it may end up being nothing, and just an interesting story out of Brazil, or it may end up being a reproductive game changer, which is, I think, where we're at right now," Curry said. Since raising her hand at that meeting, Curry estimates her practice has seen about half of the 55 pregnant Floridians who have tested positive for Zika infection. 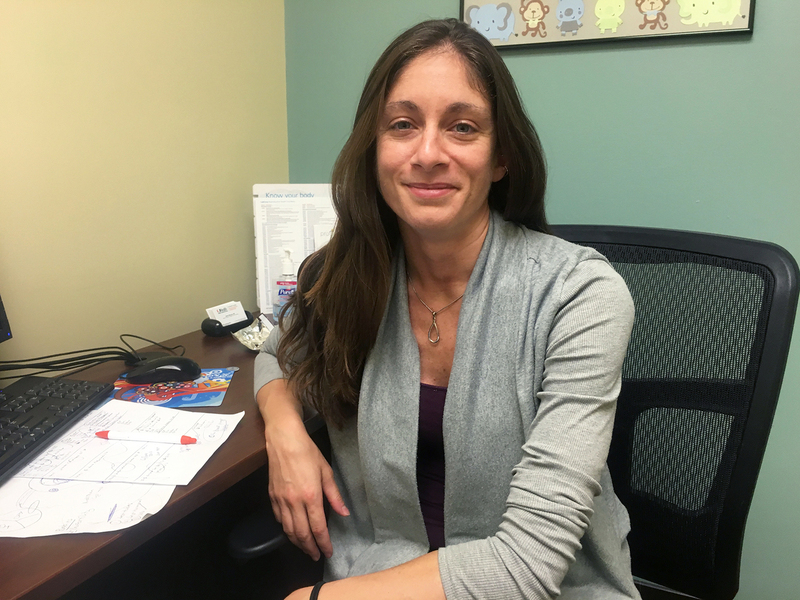 For Curry and her colleagues, discussing Zika risks with patients has become a standard part of prenatal care. So far, all of Florida's Zika cases involving pregnant women have been related to travel outside the continental United States. And for months, screening guidelines have suggested testing pregnant women who have traveled to Zika-affected areas, even if they don't have symptoms of infection. But now that there are at least 15 cases of locally acquired Zika identified in South Florida, preventing and identifying infection in pregnant women is increasingly urgent. On Monday, Dr. Tom Frieden, director of the Centers for Disease Control and Prevention, recommended Zika testing for all pregnant women who have traveled since June 15 to a 1-square-mile zone in Miami (the Wynwood and Midtown neighborhoods) where mosquitoes have likely spread the virus locally. 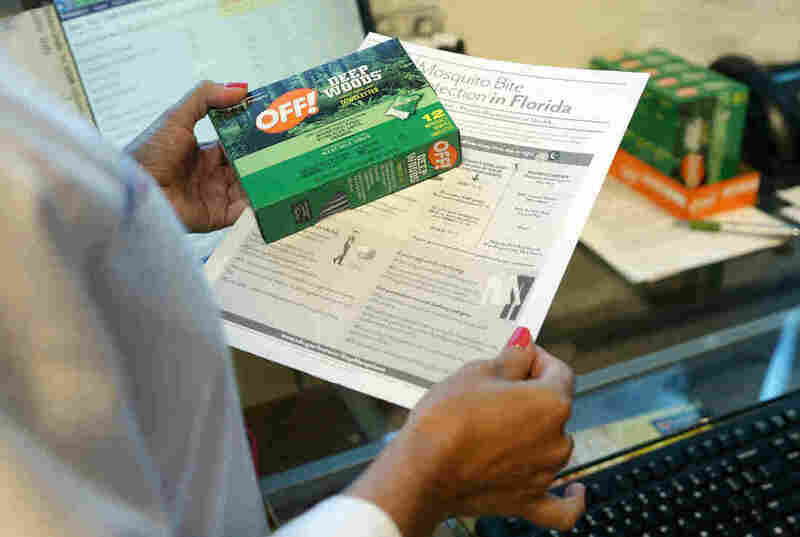 Nurse practitioner Juliana Duque holds a box of insect repellent and information on mosquito protection for pregnant patients at the Borinquen Medical Center in Miami. Zika exposure in pregnancy has been linked to microcephaly and other abnormalities, but it's still unknown how often those problems develop in the babies of women who are exposed to Zika while pregnant. "What we know about Zika is scary," Frieden said during the Monday news conference, adding that this is the first time a mosquito bite has been known to be linked to a birth defect. "But in some ways what we don't know about Zika is even more unsettling," he said. "We don't know the long-term impact Zika may have on children born to infected mothers who don't have obvious signs of microcephaly, and these effects may only become apparent months or years in the future." When Curry finds that a patient has been to a place where there is active Zika transmission, she talks to her about getting a test — usually a blood test — that will determine whether she has the Zika antibodies or active virus in her system. Those blood samples get sent to a state lab for testing. Curry said she's been getting results back within one to three weeks. And while pregnant women tend to be prepared for the anxious waiting periods that come with all sorts of routine testing for birth defects during pregnancy, nothing has quite the profile of Zika right now. "I got a mosquito bite this morning, and it's probably the first time I ever cried over a mosquito bite," said Zonnia Knight, whose second child is due in October. Knight lives in Palmetto Bay and works at a communications firm in Coral Gables, but she's spent time in Wynwood, including a dinner the night before pregnant women were told to avoid the area. Knight called her midwife, who is giving her a prescription for a blood test that looks for antibodies that indicate whether she's had a Zika infection. Susie Gilden, who works with Knight, is in her second trimester and is also asking for a Zika test because she has visited Wynwood since June 15. Until now, Gilden and her doctor in Miami Beach haven't really talked about the virus. Co-workers Zonnia Knight (left) and Susie Gilden both recently visited a neighborhood in Miami where several cases of locally transmitted Zika were reported. "It would be nice to have some proactive communication to tell me what I should be doing," said Gilden, who said she's been "stalking" the CDC website and reading up on Zika online. If a pregnant woman's Zika test comes back positive, her obstetrician has to add another layer of counseling and monitoring to her prenatal care. "As with any time you deliver bad news, they're really upset and they don't hear everything you have to say initially," said Curry, who arranges to disclose the results of Zika tests with her patients in person, rather than over the phone. There's a lot of conversation about next steps and, depending on the trimester, the mother's option to terminate the pregnancy. Curry says it's helpful to have a family member present. "Or you may say, 'Listen, I'm going to write this down for you. I'm going to see you again next week. And we're going to rehash this entire conversation when you've had a little bit of time to process things.' "
The mother may need to be retested for Zika antibodies to confirm the presence of an infection. And her doctors will pay special attention to subsequent ultrasounds for abnormal head growth or calcifications in the baby's brain. "You see these little calcifications in the brain that are really indicators that you're actually seeing loss of brain," said Dr. Aileen Marty, professor of infectious diseases at Florida International University's Herbert Wertheim College of Medicine. She explained that the Zika virus appears to be attracted to stem cells that would otherwise become brain cells. "And it basically tells the brain cell not to keep on maturing. It commits suicide and you lose those brain cells," Marty said. Microcephaly is just one of the symptoms of a baby harmed by Zika. Marty and other researchers say it appears the virus is also associated with deformities of the hands and feet, trouble developing reflexes for sucking and swallowing, and vision and hearing loss. At the end of June, the Florida Department of Health announced the state's first birth of a child with Zika-related microcephaly. The baby's mother had contracted Zika outside the United States. The state said it would connect the family with Early Steps, a program funded by the state and federal government that provides speech therapy and other interventions to children up to 3 years old who are at risk of developmental delays. "Understand that this is going to be a chronic, lifelong problem," said Dr. Charles Bauer, a neonatologist and director of the Early Steps division in North Miami-Dade. Bauer is part of a new team of doctors and therapists at University of Miami and Jackson Health System who are coordinating to care for babies with Zika-related health issues. As soon as a baby with a known Zika exposure enters the nursery, Bauer and his colleagues will be able to start screening and developing a plan with the family. "It's a brand-new area. We don't know very much about it," Bauer said. "We could be looking at lots of other things that wouldn't show up until the baby is older and going to school — learning disabilities and things like that." There are 15 Early Steps sites across Florida. Bauer's division sees around 3,500 infants and toddlers each year at a cost of about $7,500 per patient. The care is free to the family, though the program does bill insurance when possible. Bauer says it's too soon to know how Zika will affect his caseload. But he's concerned that Washington has yet to agree on funding for Zika. "They need to stop playing politics," he said. "It's a big problem and it's going to get bigger. As we know, it's escalating every day." 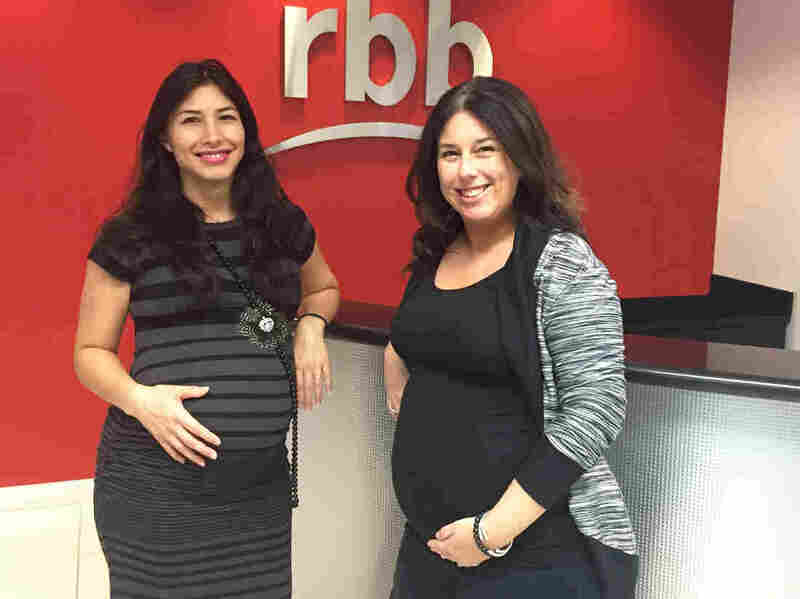 Against the backdrop of so much uncertainty, Bauer and other South Florida doctors are doing what they can to help expectant mothers and their babies. "I picked OB-GYN because 95 percent of the time I am there for the happiest day of someone's life," Curry said. "But there's a small fraction of what we do that's really hard. It's the conversations about miscarriages and stillbirths and birth defects." Curry is pragmatic. Even when she's delivering bad news, she sees opportunity to help a patient through the experience. "It's about not losing the excitement of having a new baby, but also having a tempered expectation that we don't totally know what the infection may mean for the development of the baby," she said. This story is part of a reporting partnership with NPR, WLRN and Kaiser Health News.